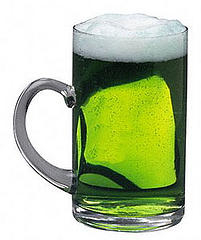 Tomorrow is St. Patrick's Day, of course. This fact alone gives you (and everyone else in the city) license to drink copious amounts of suds, brews, brewskis, pints, pilsners, lagers, ales and, well, beer all day long. On this day especially, the early bird gets the worm—or, the bar stools just to the right of the taps. To that end, we've lined up the most classic Irish alehouses in the city in order of opening time. So whether you're looking to start off with beer for breakfast, sneak out for a noontime pint, or end the day hard, we've got you covered. It's no secret that McSorley's, with their no tolerance policy towards douche bags, is the place to be. Which probably explains why people usually begin lining up around 6am to be one of the first in. If you're feeling particularly motivated, this is the place to start your day. An authentic shebeen, Molly's start time works well for those of you who can quickly check in at the office, put your coat on your seat, and slip out. If and when you're still there at noon, order a burger and see why burger junkies call this one of the best in the city. St. Patrick's Day has been celebrated at PJ's for close to 100 years and in this case practice does make perfect. You'll want to arrive as close to 11 a.m. as possible, as the place fills up quickly (note: food service doesn't begin until 11:30 a.m.). With a slightly later start time, legendary West Village speakeasy Chumley's marks the spot for those who wish to begin Friday mid-afternoon inebriation. Look to snag one of the few tables in the very back, beyond the bar. Appropriately located in Hell's Kitchen (where lightweights are not looked upon with fondness), O'Flaherty's has a four-sided bar, full menu, and is all Billy Joel, Bob Seger and The Boss, all the time. These conditions perfectly complement their start time, should you be forced to clock a mostly full day.